On the eleventh of this month [December], we commemorate our Holy Father Daniel the Stylite. Our venerable Father Daniel lived during the reign of Leo the Great, whose surname was Marcellus (457-474), and was from Mesopotamia of Syria, in the region of Samosata, from the village known as Marutha, and whose father was Elias and mother was Martha. He was born after a wondrous vision to his mother, which took place prior to his conception. At five years old, his parents offered him to a Monastery, so that the sacred child would receive his name in a sacred place. In this Monastery he was named Daniel by its director, by means of a sign. And of course from that time he was dedicated to God, fulfilling the promise of his parents, just as the Prophet Samuel was dedicated from infancy. Likewise the director of the Monastery accepted him in his very young age. But because the child did not accept, for this reason Daniel was not dedicated to God at that time. When he reached twelve years of age, he disdained the things of the world, and went to the Coenobium, where he was dressed in the monastic schema. There Daniel progressed and prevailed both in his physical age as well as spiritual virtue. 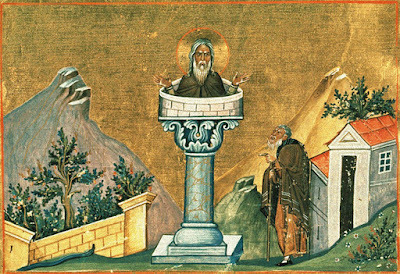 Then he went to Saint Symeon the Stylite, and received his blessing. Returning to the Monastery, he found the Abbot deceased. Wherefore by force the brothers of the Monastery made him Abbot, but he was not entirely persuaded. Because it was his aim for many years to go to the Holy Land of Jerusalem, he secretly left the Monastery, and as he walked he considered it a blessing to return again to the same Saint Symeon the Stylite. Having gone back there, he was prevented by him from going to Jerusalem; rather he was to go to Constantinople. Hence he went near to Constantinople, to Anaplon, where he enclosed himself in a temple of idols, and there he suffered many temptations by demons. Afterwards he ascended a pillar, where this renowned man showed such noble and extraordinary asceticism. Without covering or roof, he withstood the heat of the summer and the frost of the winter. Wherefore he received from the Lord the gift to work many miracles. His virtue and name became so famous, that he became known to Emperor Leo, as well as his successor Zeno in 474, and even the tyrant after him Basiliscus. They themselves went and venerated him. Having heard the things that came from his mouth, they considered following him. The Saint helped the Church of Christ as well, which was battled against at the time by heretics. Having passed his life venerably and blamelessly, he departed to the Lord. His Synaxis is celebrated in Anaplon. O Daniel, venerable Father, thou didst become a pillar of patience, and excel like the forefathers: Job in his sufferings, Joseph in temptation, and in the flesh wast like the bodiless ones. Intercede with Christ our God that He may save our souls. Thou didst ascend thy pillar and enlighten the world like a brilliantly shining star; and thou didst dispel the darkness of error, O blessed Father Daniel. Therefore we pray thee, illumine the hearts of thy servants with the true Eternal Light.